Smart Matrimony is a dating website that focuses on helping single, like minded muslims find their life partner, through the use of targeted matches, events and a comprehensive personality engine. 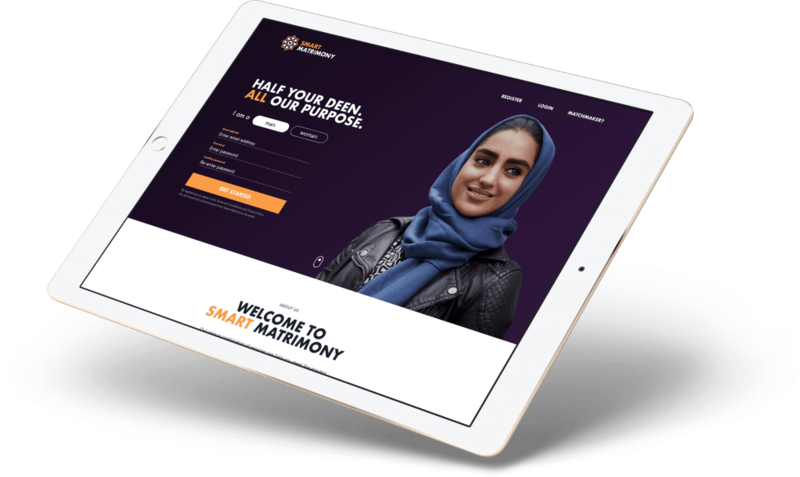 The existing Smart Matrimony branding and website didn’t align with where Smart Matrimony wanted to be nor with the client base that they wanted to cater for. The branding didn’t go any further than a logo and the website was in need of a refresh. We wanted to help them take the next natural step in their journey to being the market leading muslim matrimonial dating service. The first challenge was to re-define the branding that already existed into something more substantial, the new branding celebrates the visual culture and rich heritage of islam whilst also feeling modern and relevant to an audience already familiar with traditional dating platforms and applications. The next challenge was the re-design of the Smart Matrimony website. 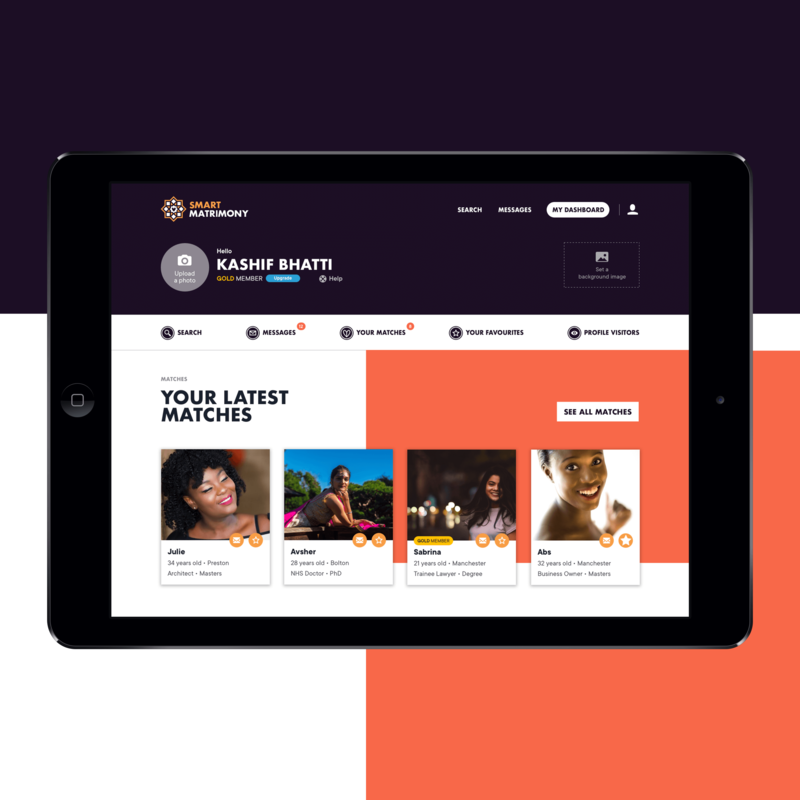 Through workshops we worked with the client to scope out the website by gaining an understanding of Smart Matrimony’s business goals, its current and future customers, any current and future functionality and where it would sit in the grander spectrum of online dating. 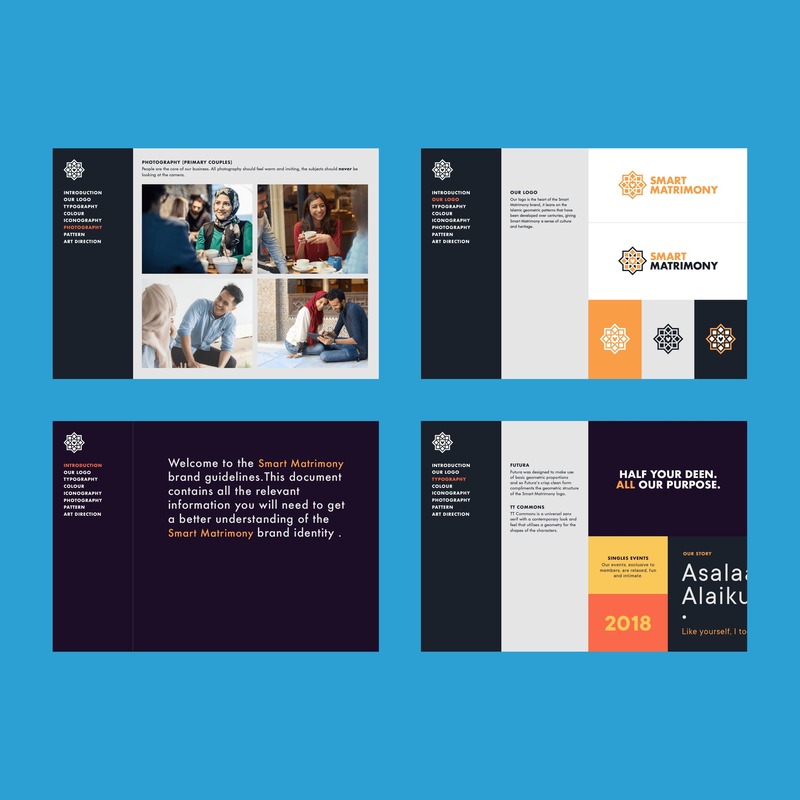 After conducting an initial phase of research we then proceeded to create information architecture and user journey documents which allowed us to see what was viably possible and helped guide the client towards an ideal solution. We wanted Smart Matrimony to be a modern, thoughtful, cheerful and passionate brand. As a result we juxtaposed large washes of dark rich purples with bold, bright oranges and blues. Large positive images of people are used liberally throughout to help convey a feeling of community and belonging. The overall feel of the site is clean and crisp, common patterns like simple tab systems allow customers to navigate what is quite a rich interface with speed and ease. Due to the nature of the industry the website is very data heavy with customers needing to know useful information such as height, weight and common interests etc, therefore the typography is kept clean and unfussy in order to promote a positive reading experience for the customer. Naturally the website was designed to be completely responsive, research and data showed us that a large portion of users visited the website on mobile phones so keeping the experience consistent across all devices was factored in from the very beginning. Smart Matrimony has a unique personality engine that enables customers to see a simple breakdown of how a persons personality is constructed and whether it aligns with their own, it’s inclusion allows a customer to make decisions much quicker and smarter, further reinforcing the user experience. I spoke to a number of creative agencies before starting my web re-design project but chose Soap for a number of reasons. The team were fully engaged from the start and spent a lot of time understanding my requirements and what I was looking for. They understood the brief, the business, the industry and the vision. The process was well thought out and structured and we kept in touch throughout the project to ensure we were on the right track. The team were flexible and responsive and the output in the end was brilliant. I wouldn’t hesitate to recommend.